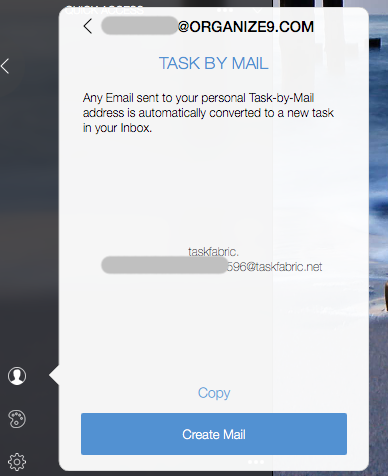 With Task-by-Mail you can send emails to Taskfabric Cloud and it will automatically create a task in your Inbox. The mail subject is used as task title and the mail body is added as comment. Taskfabric Cloud reserves an email address on signup. Emails sent to this address are then added to your Inbox. Before you can use this feature you need to be logged into Taskfabric Cloud. Follow the support document on Taskfabric Cloud Login if you are not logged in yet. Tap or click the "Head" icon to access cloud status. If you are logged in correctly you can see your account information on top and at the bottom a big red button to Logout. 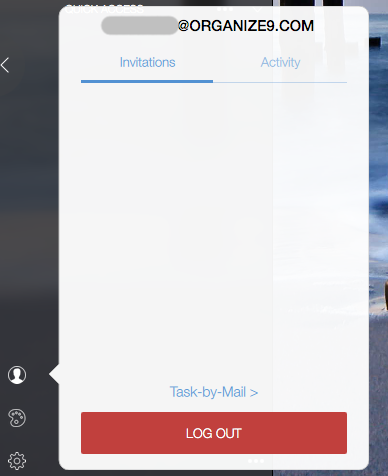 Above the logout button is a blue text button to access Task-by-Mail details. Tap or click the Task-by-Mail label. On first access the Task-by-Mail details have to be retrieved from the cloud and you will see a "Get Address" button at the bottom. Tap or click it to retrieve the Task-by-Mail address from the cloud. Your personal @taskfabric.net address is now display. Tap or click "Copy" or "Create Mail" at the bottom to use the address. You can save the address in your email app to quickly forward new email to Taskfabric Cloud. Your personal email address is automatically assigned to your cloud account upon signup and can currently not be changed manually. As the Task-by-Mail email address is assigned to you personally, you can create workflows from other apps as well. The email address can be used to create tasks from any other tool that is able to send emails. Put your new task title in the email subject line and the task will be added to your Inbox.